Bernie Sanders Raises $26 Million In 3rd Quarter, Nearly As Much As Clinton : It's All Politics From 60 points down and a third of the money, Bernie Sanders is now up in polls and on par in fundraising with Hillary Clinton, who raised $28 million in the third quarter. Bernie Sanders waves as he leaves the New Hampshire Democratic Party State Convention last month. The official reporting deadline isn't until Oct. 15, but Democrats Hillary Clinton and Bernie Sanders are already out with big numbers for the third quarter. And those numbers tell us something about the state of the presidential race on the Democratic side. 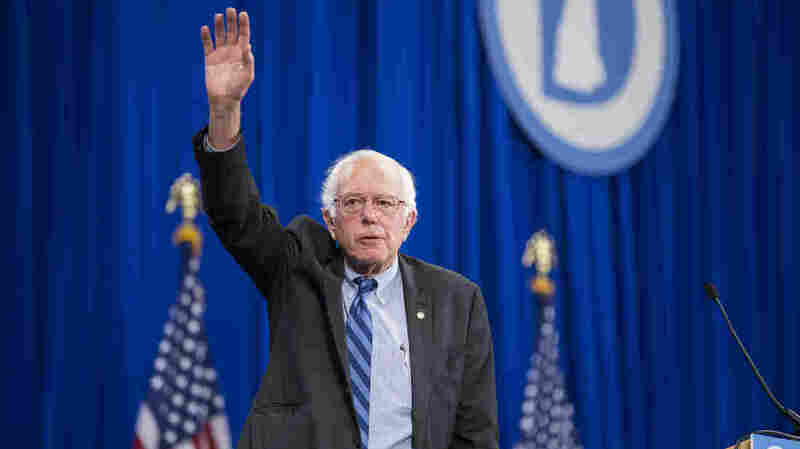 Sanders' insurgent campaign raised $26 million in the third quarter — $2 million of it in the last day, according to campaign spokesman Michael Briggs. Almost all of that was in small-dollar donations. Sanders' campaign said the Vermont independent has gotten more than 1.3 million donations (from 650,000 donors — some have given multiple times) since Sanders started running. This is a dramatic increase from his fundraising totals in the previous three months and is a reflection of a summer of big crowds and surging poll numbers. Hillary Clinton's campaign gave its own preview of third-quarter fundraising, saying she raised $28 million, more than Sanders, but not by much. A campaign aide said 93 percent of her donations were $100 or less. "We are thrilled and grateful for the support of hundreds of thousands of donors across the country, helping us raise a record $75 million in the first two quarters," campaign manager Robby Mook said in a statement. "Thanks to our supporters, we are able to meet our goals and build an organization that can mobilize millions of voters to ensure Hillary Clinton is their fighter in the White House." Although Clinton's campaign touts its small donors, throughout the campaign, Clinton has also held numerous big-dollar fundraisers, often several in a single day. Clinton even held a fundraiser Wednesday night as the moments ticked down to the end of the quarter. Held at the 40/40 Club in New York, 130 attendees donated $1,000 to $2,700 each. In the previous quarter's campaign-finance reports, Clinton held a wide gap over other campaigns. She had more than twice as much as any other campaign and more than three times as much as Sanders by the end of the second quarter. She had raised $47.5 million by June 30 compared with Sanders' $15.2 million. Additionally, more than three-quarters of Sanders' donations had come from donations of $200 or less, while the majority of Clinton's donations had come from midsize donations — between $200 and the $2,700 limit for donating to a campaign. (NPR broke down all the candidates' donations here). The campaigns of former Maryland Gov. Martin O'Malley, former Virginia Sen. Jim Webb and former Rhode Island Gov. Lincoln Chafee did not release any fundraising numbers for the third quarter.